The UFC will debut in mainland China this Saturday with a main event where former middleweight champion Michael Bisping steps up on two weeks’ notice to face the always dangerous Kelvin Gastelum in a five-round fight. Gastelum was contemplating a move back down to welterweight following his last fight, but the opportunity to headline this card in China kept him at 185 pounds. Now he'll have the opportunity to face Bisping, who is looking to wash the bad taste of defeat out of his mouth following a loss to Georges St-Pierre at UFC 217. Also on the card, Li Jingliang will look for his fourth win in a row when he takes on American powerhouse Zak Ottow, while highly touted prospect Muslim Salikhov faces off with Alex Garcia in a welterweight showdown. In today's fantasy preview, we'll examine these fights and several more to see who has the advantage going into Saturday's card and if someone is primed for an upset at UFC Fight Night: Bisping vs. Gastelum. These are the fights that are just too close to call, but a few minor differences between favorite and underdog could lead one fighter to victory and the other to defeat. Michael Bisping returns just three weeks after his middleweight title fight to challenge Kelvin Gastelum in the main event from Shanghai. Gastelum was already deep in preparation for this fight while originally expecting to face Anderson Silva, so he's certainly got the edge when it comes to time getting ready for this bout. While he remains an undersized middleweight, Gastelum is still a powerhouse with fast hands, good boxing and very solid power. He's earned knockouts against tough as nails fighters such as Tim Kennedy while competing at 185 pounds, so don't blink when he begins throwing his combinations. Plus, Gastelum is a very solid wrestler both offensively and defensively so he's no stranger to the takedown either. Of course, Bisping will have the experience edge because competing in main event fights like this is nothing new to the 38-year old veteran. The real question with Bisping is how much of his last loss to St-Pierre is still lingering as he gets ready to step back into the Octagon this weekend. Bisping didn't take a ton of damage in the fight with St-Pierre, but he did get caught with a hard counter left hand that put him down before being finished with a rear naked choke. Bisping has to be wary of Gastelum's hands because he hits fast and hard with very good boxing from the outside or inside, despite giving up four inches of reach. Gastelum is particularly dangerous in the first couple rounds, so Bisping has to be aware of that when he gets drawn into exchanges with the former Ultimate Fighter winner. Now the longer this fight goes, the more it will favor Bisping, as he's a conditioning machine and will absolutely press the pace from the third round forward. The key for Bisping is surviving those early exchanges with Gastelum and not getting clipped by one of his big punches. Gastelum isn't well known for his kicking game, which could help Bisping because that's one less weapon he has to worry about. The longer this fight goes, the more it favors Bisping, so if he can make it to the third round, it really does become his fight. That being said, Gastelum is ferocious in those first two rounds, and if Bisping has one lapse in judgment during an exchange, he could get flattened by a combination. 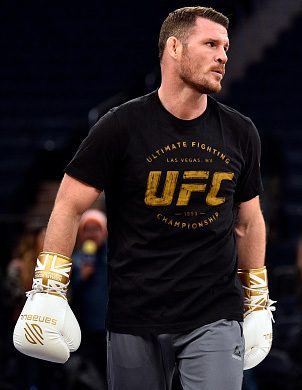 While this fight truly is a tossup, Bisping's experience and desire to bounce back following his last loss could be enough to put him over the edge in a five-round fight. Of course, Gastelum only needs one big combination and he could be celebrating with a win over a former middleweight champion. 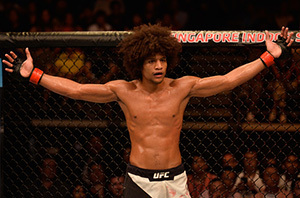 One of China's top fighters makes his UFC debut this weekend as Wang Guan takes on Alex Caceres in battle at 145 pounds. With a 19-1-1 record, Wang is a very experienced fighter who has earned 14 career knockouts, which means he's got no fear when it comes to swinging heavy leather with any of his opponents. So there's little doubt that he's going to be gunning for the finish on the feet, especially while facing a fighter like Caceres, who is very slick on the ground. It's tough to figure out which version of Caceres will show up when he steps into the Octagon. There are moments where he looks like a future title contender and others where he puts on a baffling performance that just doesn't add up when the fight is over. That being said, Caceres has faced a laundry list of top fighters throughout his career and that experience will help him a ton against a fighter like Wang, who hasn't taken on top competition like that throughout his career. Caceres just has to be wary of the power Wang possesses, but as long as he can stay out of range of those powerful hands, he should be able to employ a smart striking strategy and even mix in a couple of takedowns to keep his opponent guessing. Of course, the hype around Guan could be for real and it’s possible that he pulls off the shocking win, but the smart pick remains with Caceres based on Octagon experience against the best of the best throughout his career. Speaking of hyped prospects, Muslim Salikhov will make his highly anticipated debut this weekend against Alex Garcia in a welterweight matchup. Salikhov has gained a reputation around the world as one of the most vicious knockout artists in the game, with a creative arsenal that would even make Anthony Pettis do a double take. Salikhov is fresh off a spinning back kick knockout against former UFC fighter Melvin Guillard and he's finished his past nine opponents in a row. While he's best known for his striking, Salikhov also comes from a Sanshou background, which is a striking art that also incorporates throws and takedowns. That means Salikhov will have no qualms about taking this fight to the ground if that's what he needs to do to win. In this particular matchup, Salikhov may be using his grappling defensively, as Garcia is a mound of muscle who loves to power his opponents to the ground. In fact, Garcia averages nearly four takedowns per fight, so it's probably no surprise that he'll look to ground Salikhov's prolific striking game by putting him on the mat. Garcia also has the experience edge with seven fights inside the Octagon, but he's put a mixed bag of performances together during that time. Assuming Salikhov can battle through the nerves of his first UFC fight, he should be able to put on a dazzling display of striking to beat Garcia in this fight. Garcia has struggled in the past against long, dangerous strikers, and Salikhov will throw everything at him, plus the kitchen sink, as long as this fight stays standing. Eventually, the odds are on Salikhov finding a home for one of his knockout shots that will earn him a victory in his UFC debut. Chase Sherman has quickly become one of the most talked about heavyweights on the UFC roster, not only because of his two wins in a row, but also thanks to a constant presence on social media where he's earned a reputation as a must follow on Twitter. 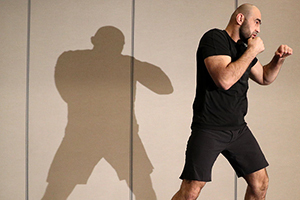 Social media won't play a factor in his fight, however, and Sherman has a tough test ahead of him this weekend in Shamil Abdurakhimov. Abdurakhimov is returning to action for the first time in nearly a year after suffering a TKO loss to Derrick Lewis in a fight he was winning until getting caught and finished in the fourth round. Prior to that setback, Abdurakhimov had won two fights in a row with victories against Walt Harris and Anthony Hamilton. Abdurakhimov hasn't defined his UFC career with big finishes, but instead he outworks his opponents to earn a pair of decision wins. That's always a dangerous game to play as a heavyweight because it only takes one good shot to land to completely change the complexion of any fight. Sherman certainly has that kind of power in his hands, as he's shown in a slew of knockout wins throughout his career. Sherman is definitely a “go big or go home” type of fighter who likes to take chances, and while it doesn't always pay off, it's tough to imagine him being involved in a boring fight. That said, Sherman has to be careful taking too many chances in this fight or Abdurakhimov will be all over him with an aggressive striking attack, a stifling clinch game and takedowns to slow the action to a grind. Sherman definitely maintains a big edge with his volume striking, where he's landing more than six significant shots per minute, but Abdurakhimov only absorbs two and a half strikes per minute, so that could lead to a stalemate on the feet. If Abdurakhimov can then counter with his clinch work against the cage, combined with a consistent striking attack where he uses his punches to set up takedowns, he could frustrate Sherman over the course of three rounds to earn a victory. These are the fights that appear to be a little more one-sided, but remember that this is MMA, where anything can - and usually does - happen. 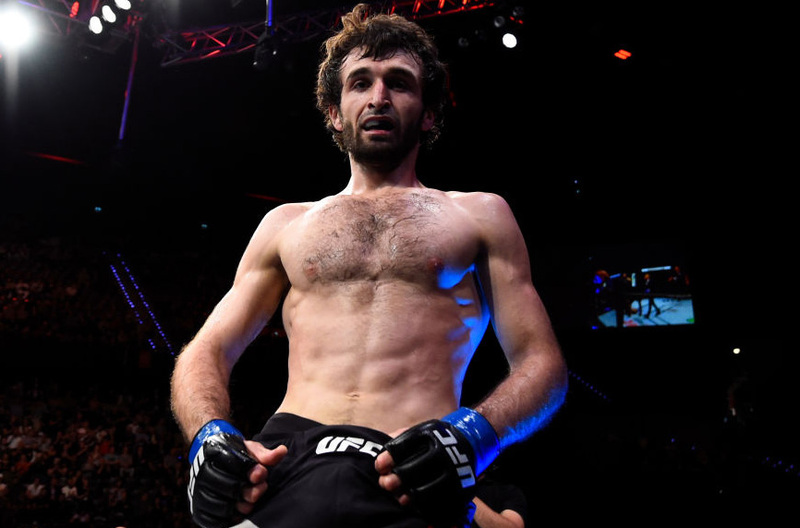 There are few fighters on the UFC roster today who have received more rave reviews than featherweight prospect Zabit Magomedsharipov. 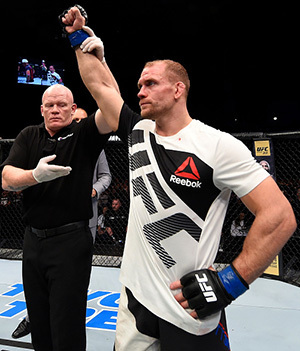 He lived up to the hype in his UFC debut when he earned a Performance of the Night bonus with a submission victory against Mike Santiago. Magomedsharipov combines a blistering striking attack with a world-class ground game that makes him one of the most dangerous matchups at 145 pounds. Sheymon Moraes is no slouch coming into his UFC debut while holding wins over Octagon veterans such as Robbie Peralta and Pedro Nobre. His only professional loss came to current top 10-ranked bantamweight Marlon Moraes and there's certainly no shame in that. Unfortunately, Marlon Moraes also happens to be a teammate and primary training partner for Magomedsharipov, so there's little doubt that he's going to get the Russian fighter well prepared for this matchup. While this fight may be a little more even on the feet, Magomedsharipov has world-class ground skills to compliment his striking arsenal and that's what makes him a very tough matchup for Moraes. Make no mistake, Moraes is a tough customer with a bunch of impressive knockouts on his record, but he's facing a buzzsaw this weekend in Magomedsharipov. Don't count Moraes out, but he'll likely have to wait to get his first UFC win until after he faces a top featherweight prospect like Magomedsharipov, who promises to be a ranked fighter sooner rather than later. Wu Yanan will look to build upon her 9-1 professional record when she faces American Gina Mazany in a women's bantamweight bout this weekend. Wu has an impressive bunch of wins on her resume, but unfortunately she hasn't faced top-notch competition yet so it's tough to predict how she'll look in her UFC debut. Wu does possess knockout power, which is a big benefit for her coming into this fight, and she'll have the home crowd behind her, but that can sometimes add as much pressure as it does anticipation for a fight. Mazany didn't get much cage time when she debuted against former title contender Sara McMann in February, but she has felt those notorious Octagon jitters. 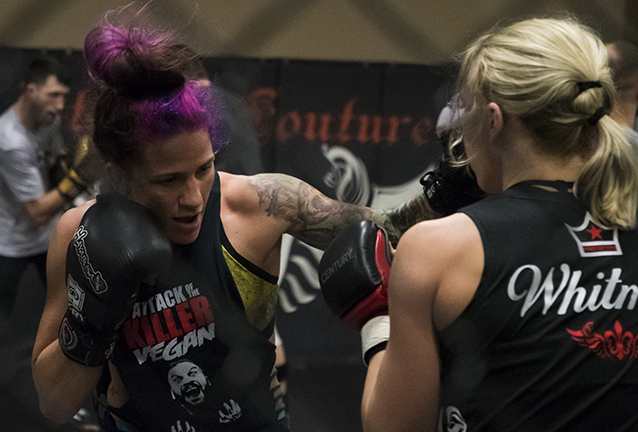 Prior to that setback, Mazany had won her first four professional bouts in impressive fashion and she trains with a top-notch team in Las Vegas with a group of coaches that includes former women's bantamweight champion Miesha Tate. Mazany doesn't do anything flashy, but fundamentally she's tough to deal with on the feet or on the ground. While it's tough to see a finish in this fight, Mazany's ability to control the Octagon and potentially ground Wu's striking attacks with takedowns could give her the edge over three rounds. Mazany has to be careful not to allow Wu to land a big finishing shot on the feet, but she should be able to outwork the debuting bantamweight to get her first UFC win. Li Jingliang has looked better than ever lately while winning his last three fights in a row, including two of those victories coming by way of knockout. Li is a massive welterweight with a ton of power in his punches, and he also lands with good volume and accuracy. In fact, Jingliang lands just under five significant strikes per minute, but he also hits with fight-finishing power. He also mixes in more than a takedown per fight to keep his opponents guessing. Needless to say, American fighter Zak Ottow definitely has a hill to climb if he wants to get a win in China this weekend, but he's got the skill set to pull off the upset. Ottow is very active on the feet, with nearly the same output in volume as Li, while actually absorbing almost a strike less per minute than the Chinese welterweight. While Ottow isn't known for his wrestling, he's very powerful from inside the clinch and that could bode well for him considering the way that Li has been able to outmuscle nearly every opponent he's faced. Ottow has to use that takedown defense to keep Li honest if he attempts to take this to the ground. Now on paper, Li should certainly earn a victory in this fight. He hits hard, lands with better volume and accuracy and he'll have the added benefit of very little travel to get to this event. Still, Ottow is a grinder and he's somehow managed to go to three straight split decisions in his UFC career. While that's probably frustrating for Ottow that he's been unable to separate himself from the competition, that also means he's never out of a fight. Ottow keeps it close and that's always going to make him a dangerous fighter because he doesn't open himself up for those big knockout shots. Assuming Ottow can stay away from Li's power, he should be able to counter with enough of a striking attack to make this fight a toss-up by the time the final horn sounds. In a fight like that, Ottow remains a very solid upset pick to get a win this weekend.